Maurizio Baglini studied with Giampiero Semeraro at the Conservatory La Spezia and with Piero Rattalino and Lazar Berman at the Piano Academy "Incontri col Maestro" in Imola. At a very young age, he was a prizewinner in major International Piano Competitions such as Busoni in Bolzano, Chopin in Warsaw, and William Kapell in Maryland. 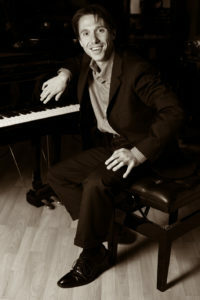 In 1999, at only 24 years of age, he won the grand prize at the World Music Piano Master di Montecarlo with the unanimous consensus of the jury. Baglini is internationally active as a concert pianist and performs as a soloist in important Orchestral Seasons and famous worldwide festivals. He is giving regular master classes at the Fondi academy and teaches at the conservatories such in Parma and Udine. Baglini is the artistic director and one of the founders of the Amiata-piano-festival in Cinigiano/Grosseto, Tuscany and artistic director of Teatro di Pordenone.